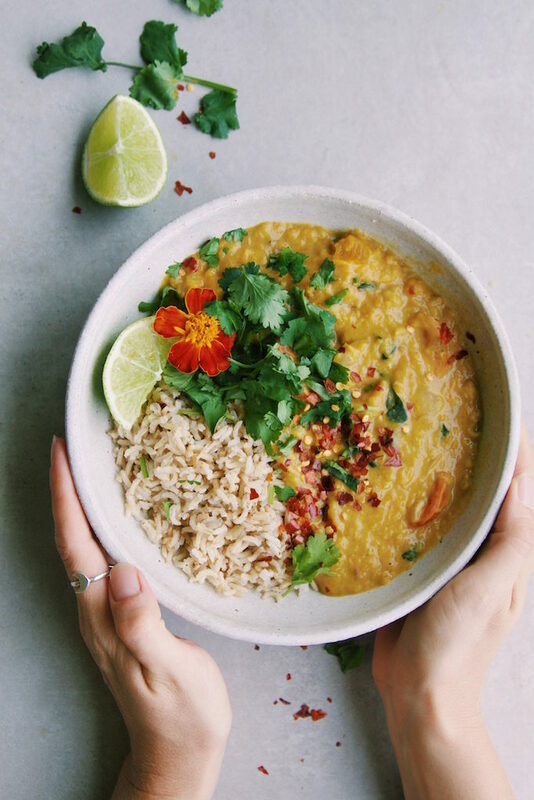 This is my go-to weeknight dahl recipe! Mainly because it’s super easy to make and I don’t know about you but I usually like to make quick meals during the week. A big batch of this delicous dahl will probably last you a few days and is perfect to take to lunch or to enjoy the following few nights. Well the main reason I love dahl (besides being increadibly delishh) is its made using red lentils and lentils= high fibre! I’m all about eating high fibre food in my diet for a number of reasons… It helps lower cholesterol, is great for your digestive health by preventing constipation and digestive disorders, will help stabilize blood sugar levels as it’s slow digesting which is especially great for diabetes. Lenitls are also a great source of protein! 1. Finely dice the onion and add it to a medium to large saucepan or crock-pot. Add in a small amount or water or olive oil and cook on a medium heat until soft. 2. Add garlic, curry powder, and ginger and stir into the onion (you may need to add more water at this stage as it starts to stick). Add lentils, nutritional yeast, stock cube and water and stir together then add pumpkin, coconut milk and tomatoes. Let simmer on a low heat for 15-20 mins or until pumpkin is very soft with lid half on stirring occasionally so it doesn’t stick to bottom. 3. Once it’s cooked, turn off heat mash the pumpkin with spoon so it’s all combined and add in spinach leaves. 4. Serve with brown or white basmati rice and add toppings! Store left overs in fridge. Also perfect to take to lunch the next day.